Well, we’ve now spent quite a bit of time with Bespoke Post. While at the start of this all I was a bit skeptical of the much higher price tag for Bespoke Post at $45 compared to the $25 or so that Gentleman’s Box or SprezzaBox costs, I think I have fully reversed my position on the matter. Before even diving into this most recent box, I can say with confidence that I think the higher price tag is well worth it. Looking back at these last couple of months, compared to all the various subscription services for guys that we have been testing, it is the products in Bespoke Post boxes that I actually, genuinely use the most in my day to day life. The products Bespoke Post sends are the ones that have me most excited to use and enjoy. 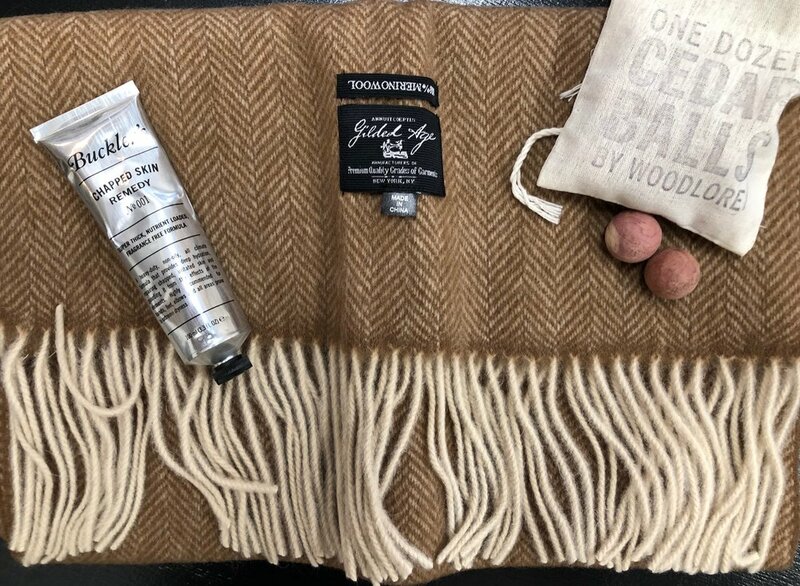 Scarf: I went with the camel herringbone scarf as I already have some nice grey/darker plaid scarves. The scarves are all 100% merino wool, and come from Gilded Age. Suggested retail looks to be about $130 for these scarves. I think that is way high — you can get some 100% cashmere scarves for that price. Still, this is a very nice and high quality scarf. The pattern is beautiful, it goes with just about everything, and the material is high quality. It is a true wool, which means that it is a bit scratchy and stiff at first, but this is the sort of scarf that will break in with time. It looks nice, feels nicer and more personal each time you use it, and adds a subtle but elegant flair to any outfit. I have worn this scarf a few times already and really like it. As far as scarves go, it is absolutely solid. A fantastic pick from Bespoke Post, and well worth the $45 subscription fee for this item alone. 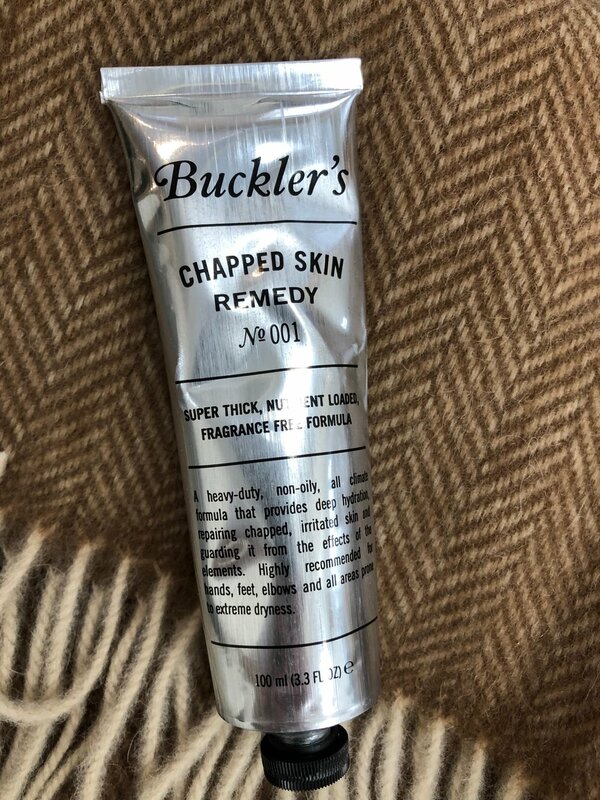 Buckler’s Chapped Skin Remedy: You might not know this, but I consider myself to know hand creams pretty well. I have tried quite a few in my day, and I have to say that this one ranks amongst the best. For when your hands are really chapped, I swear by O’Keefe’s Working Hands. It’s non-oily, unique in texture, only requires a little bit to go a long way, and works wonders. It’s magical. This Buckler’s cream is very similar to O’Keefe’s. It has a similar non-oily texture, though is a bit more cream-like than O’Keefe’s. The nice thing about it also is that it is intended for any dry skin, not just your hands. It rubs in nicely, and works super well. It has a nice, very subtle scent which I actually like. (If you prefer scentless, again, I must recommend O’Keefe’s.) As far as chapped skin creams go, this is an excellent option. Again, another fantastic pick by Bespoke Post. 12 Cedar Balls: Not too much to say here. Scatter them in your drawer and closet and keep away the moths! A nice thing to have, and something most guys forget to actually buy (and rebuy — they lose their effectiveness once they lose their scent after a few months). So, it’s a nice “bonus” inclusion in this box. In the end, I have already used every single one of the products in this box. I find them all useful and high quality. They have genuinely added themselves to my life and my daily routine, which can be said about every single product in every single Bespoke Post box that I have received. This is not something I can say about any of the other subscription services out there. True, it is not a surprise what you get with Bespoke Post as they send you your options a few days before it is shipped. And true, it is almost double the price of the other similar options at $45 per month. But, in the end, it’s really not that similar. Bespoke Post offers a much wider range of options, much higher quality products, and then, in the end, a much better value. I have said it before and I will say it again. I would rather six months of Bespoke Post than 12 months of SprezzaBox (our winner over Gentleman’s Box). None of this is to say that the other services out there are bad — not at all. It’s just that if you are going to subscribe to a service like this, I feel like you might as well “do it right.” Get something you are actually going to use, enjoy, and feel is high quality, worth your money, and actually brings you value. Sometimes, of course, the other services do just that. I have found that Bespoke Post does it just about always, though. If a monthly subscription service sounds like something you would be interested in, I would suggest starting by considering Bespoke Post and work from there. They claim they are the monthly subscription service “for guys that give a damn” and I think that is absolutely accurate.